Recently, I was asked by a few friends how do I select for stocks in Singapore market. For those who has traded or invested in the market long enough, you would have known that previously one can find stock screener tool easily for global market but not the local one. However, this has changed with the launched of 'mygateway' from SGX. There are many other tools available from the portal. 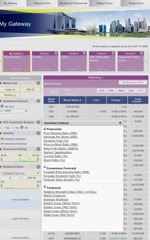 Using the stock screener tool from 'mygateway', one would be able to screen local stocks based on your criteria. You can select up to 4 criteria, below is the screenshot from the portal. This is just the first step, it just simply help you to narrow down on your search. In the next post, I will share how we can screen stocks using some of the criteria available from the portal. It's a wonderful website about stock screener. But for more informstion about stock screener to visit stock screener Free Stock Screener, Stochastic Oscillator and Volume Oscillator stock tool to analyze various securities across the NASDAQ and NYSE. thanks for visiting and comments. I also just come across google finance which is able to do FA screening across various exchanges including SG. Hi, check out the ft.com screener, quite good too. STI - has the down trend reversed?